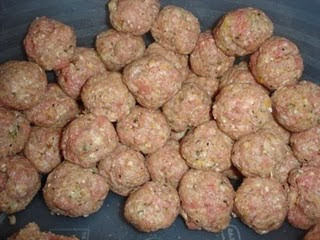 Una Mamma Italiana: The humble beginnings of POLPETTE! The humble beginnings of POLPETTE! Growing up, my family moved all over the United States - and even Canada. Every new move brought an important mission - to find a decent Italian restaurant in the area. Seems like an easy task, right? Don't be deceived my friends....good home-cooked Italian meals are not easy to find when dining out - ESPECIALLY when we lived on the West coast. I am still facing that problem today, living in Spokane, Washington (still waiting on tips for the good local Italian eateries here, people). But over the years I have come to not really expect much. No restaurant's sauce was like my mother's, and definitely NO restaurant could make a good meatball. So needless to say we stick to making our own meatballs at home these days. And with the wonderful festa of Liberazione coming up, you have the perfect occasion to try this special family recipe. I'm going to do my best to come up with measurements - you know how Nonna's recipes never have tablespoons or cups involved! Food history tells us that meat was often for the rich. It was precious - so no part was wasted. The butcher's scraps were therefore saved so that people might get yet another meal out of their pricey meat. Meatballs were a way of using these scraps. Before the invention of the meat grinder in the 1800's, leftover meat would have to be pounded or ground by hand or with sharp tools. Meatballs were a way of using these scraps. 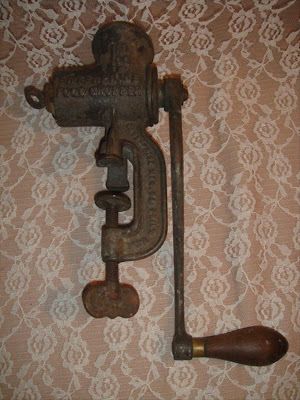 A real antique meat grinder from back in the day! 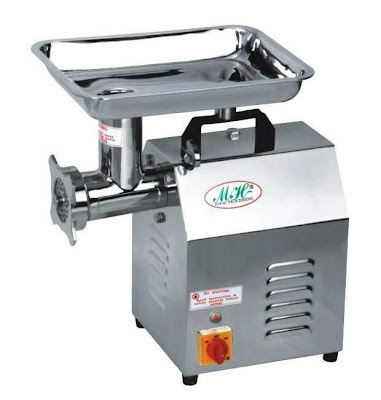 Finally by 1845, a meat grinder with a rotating metal blade made ground meat available to the public. What a long way we've come! this is what we used to grind our own pork for homemade sausage! simply roll regular size balls with this same recipe. These meatballs are the best ever!! My protege - a little "Mammarella"